Vedette is great for women who want more control and smoothing than Spanx offers, but it's not as rigid as Squeem. There is NO boning in this style. It's completely smooth on the front and the material is really thick and firm. It has a crotch hole, so it's easy for bathroom breaks and the straps are detachable. The legs on this are pretty long for coverage. It will come 1-3 inches above the knee, depending on your height/leg length. This is great for women who want smooth under dress pants, longer dresses, etc. You won't be able to wear this with dresses/skirts above the knee, however. Please note: Vedette runs a little small. If you fall between two sizes, get the larger size. 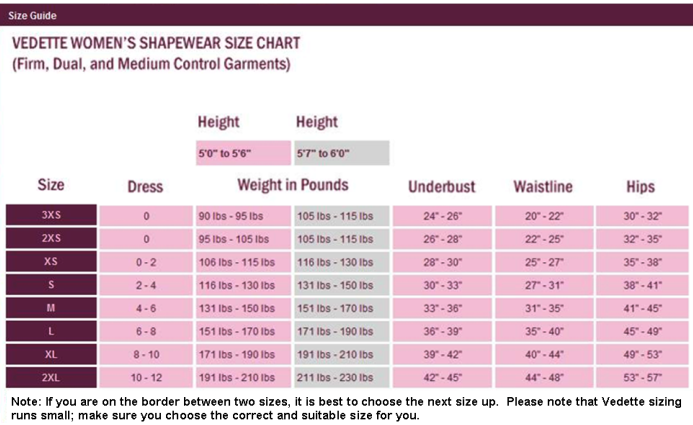 Control your shape with the Vedette Stephanie Firm Control Full Body Shaper #104. The firm forming material smooths out mass while tucking in your tummy, sides, and back to help you achieve that ideal hourglass shape.